This article is about the engineer. For the French instrument maker, see Etienne Lenoir (instrument maker). Jean Joseph Étienne Lenoir also known as Jean J. Lenoir (12 January 1822 – 4 August 1900) was a Belgian engineer who developed the internal combustion engine in 1858. 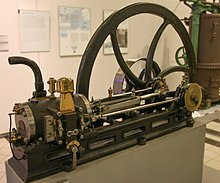 Prior designs for such engines were patented as early as 1807 (De Rivaz engine), but none were commercially successful. Lenoir's engine was commercialized in sufficient quantities to be considered a success, a first for the internal combustion engine. He was born in Mussy-la-Ville (then in Luxembourg, part of the Belgian Province of Luxembourg since 1839). In 1838, he emigrated to France, taking up residence in Paris, where he developed an interest in electroplating. His interest in the subject led him to make several electrical inventions, including an improved electric telegraph. By 1859, Lenoir's experimentation with electricity led him to develop the first internal combustion engine which burned a mixture of coal gas and air ignited by a "jumping sparks" ignition system by Ruhmkorff coil, and which he patented in 1860. The engine was a steam engine converted to burn gaseous fuel and thus pushed in both directions. The fuel mixture was not compressed before ignition (a system invented in 1801 by Philippe LeBon who developed the use of illuminating gas to light Paris), and the engine was quiet but inefficient, with a power stroke at each end of the cylinder. In 1863, the Hippomobile, with a hydrogen gas fueled, one cylinder, internal combustion engine, made a test drive from Paris to Joinville-le-Pont: top speed about 9 km in ~3 hours. Lenoir was an engineer at Petiene et Cie (Petiene & Company), who supported him in his founding of the companies of Corporation Lenoir-Gautier et Cie engines Paris and Société des Moteurs Lenoir in Paris in 1859, with a capitalization of two million francs and a factory in the Rue de la Roquette, to develop the engine, and a three-wheeled carriage constructed to use it. Although it ran reasonably well, the engine was fuel inefficient, extremely noisy, tended to overheat, and, if sufficient cooling water was not applied, seize up. Nevertheless, Scientific American reported, in September 1860, that the Parisian newspaper Cosmos had pronounced the steam age over. By 1865, 143 had been sold in Paris alone, and production of Lenoir Gas Engines, by Reading Gas Works in London, had begun. Dates vary from 1860 to 1863 on when Lenoir built his automobiles. It is apparent that he built a small carriage with his engine around 1860. His automobile of 1862 was capable of 3 kilometers per hour. In 1861, he put one of his engines in a boat. In 1863, Lenoir demonstrated a second three-wheeled carriage, the Hippomobile, little more than a wagon body set atop a tricycle platform. It was powered by a 2543 cc (155 in3; 180×100 mm, 7.1×3.9in) 1.5 hp, "liquid hydrocarbon" (petroleum) engine with a primitive carburettor which was patented in 1886. It successfully covered the 11 km (7 mi) from Paris to Joinville-le-Pont and back in about ninety minutes each way, an average speed less than that of a walking man (though doubtless there were breakdowns). This succeeded in attracting the attention of Tsar Alexander II, and one was sent to Russia, where it vanished; Lenoir was not pleased. In 1863, he sold his patents to Compagnie parisienne de gaz and turned to motorboats, instead, building a naptha (Ligroin) fueled four-cycle in 1888. Jules Verne wrote in his 1863 novel Paris in the Twentieth Century of boulevards crowded with horseless carriages, "the Lenoir machine applied to locomotion." Most applications of the Lenoir engine were as a stationary power plant powering printing presses, water pumps, and machine tools. They "proved to be rough and noisy after prolonged use", however. Other engineers, especially Nikolaus Otto, began making improvements on internal combustion technology, which soon rendered the Lenoir design obsolete. Less than 500 Lenoir engines of between 6 and 20 hp were built, including some under license in Germany. In 1865, Lenoir returned to electrical engineering. He developed a new type of automatic telegraph device that could send information in written form. This device was of great value during the Franco-Prussian War. He also installed an improved version of his engine in a 12 meter long boat for a Mr. Dalloz who used it on the Seine for two years. 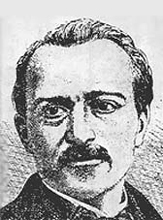 Lenoir was granted French citizenship in 1870 for assistance during the Franco-Prussian War, and awarded the Légion d'honneur in 1881 (not for the engine, but for developments in telegraphy). Lenoir's later years were impoverished despite his engine's success. On July 16, 1900, not long before his death, Lenoir received an award from the ACF (Automobile Club de France), which was a vermeil plate with the inscription, "In recognition of his great merits as an inventor of the gas engine and builder of the first car in the world." Lenoir died in La Varenne-Sainte-Hilaire on 4 August 1900. ^ a b Weeks, Lyman Horace (1904). Automobile Biographies: An Account of the Lives and the Work of Those who Have Been Identified with the Invention and Development of Self-propelled Vehicles on the Common Roads ... Monograph Press. p. 89. Retrieved 10 January 2018. ^ a b c d e f Georgano, G.N. Cars: Early and Vintage 1886–1930 (London: Grange-Universal, 1990), p.9. ^ a b c d e f Wise, David Burgess, "Lenoir: The Motoring Pioneer" in Ward, Ian, executive editor. The World of Automobiles (London: Orbis Publishing, 1974), p.1181. ^ a b c Wise, David Burgess, "Lenoir: The Motoring Pioneer" in Ward, Ian, executive editor. The World of Automobiles (London: Orbis Publishing, 1974), p.1182. ^ a b c d e "Jean-Joseph Étienne Lenoir". The Motor Museum in Miniature. G.N. Georgano Cars: Early and Vintage 1886–1930. London: Grange-Universal, 1990 (reprints AB Nordbok 1985 edition). ISBN 0-9509620-3-1. Wise, David Burgess, "Lenoir: The Motoring Pioneer" in Ward, Ian, executive editor. The World of Automobiles, p. 1181–2. London: Orbis Publishing, 1974. Wikimedia Commons has media related to Étienne Lenoir. This page was last edited on 11 April 2019, at 15:42 (UTC).